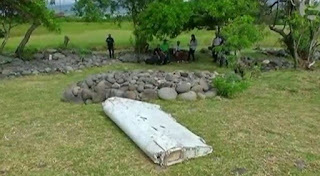 A 2m (6ft) piece of wreckage, which seemed to be part of a wing, was found by people cleaning a beach in Saint-André, on the east coast of La Réunion island. A team of investigators is on its way to the island to verify whether the debris could be part of missing Malaysia Airlines flight MH370. We expect in two days we can complete the verification. Aviation experts have suggested the piece could be a flaperon, a hinged part on an aircraft wing that can be lowered to control the roll and bank of a plane. A serial number – BB670 – has been reportedly spotted on the debris. If the flaperon is confirmed to be from a Boeing 777 – and we do not yet have that confirmation – it is almost certain to be MH370, the only aircraft of that type to be missing.